Sophomore libero Sydney Welch prepares to serve the ball during a volleyball game against American in Auguest. Last year as a freshman, Sydney Welch powered volleyball’s back row as the team’s libero. But when she returned to the court this year, the sophomore learned a familiar face would take the position and assist her in leading the team’s defensive game. Freshman Bella Bowman and Welch – both rostered liberos – have been a powerful force for the Colonials on the back line together this season. Bowman formally plays the libero position, while Welch occupies the left side of the back row so both can play defense as the team’s top two passers. Together, the pair accounts for 40 percent of the team’s 548 digs through five games. 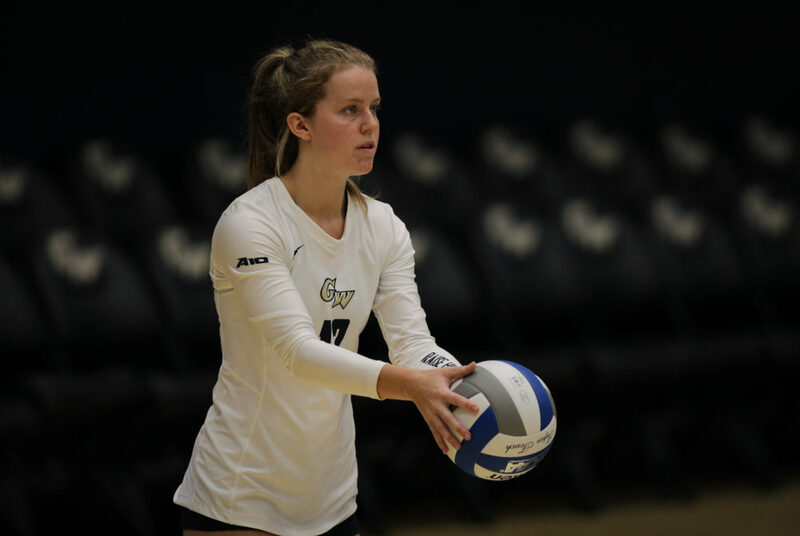 GW ranks third in the Atlantic 10 for total digs, even as eight of the conference’s nine other teams have played nine or 10 contests to the Colonials’ eight. Bowman’s average of 5.24 digs per set is good for second in the Atlantic 10, and her 151 digs rank her third in the conference. As a freshman last year, Welch was the team’s starting libero and finished the season with 469 digs, ranking fifth in the A-10. Welch was the only Colonial to finish the season averaging more than three digs per set. Head coach Sarah Bernson said Bowman’s statistics, as well as her three-inch height advantage, are what gave her a slight edge over Welch for the starting libero spot. Freshman libero Bella Bowman serves a ball during a vollegball game against American in August. As the libero last year, Welch played left back. Bernson said Welch was able to keep the familiar spot this year because Bowman took on the middle back position. 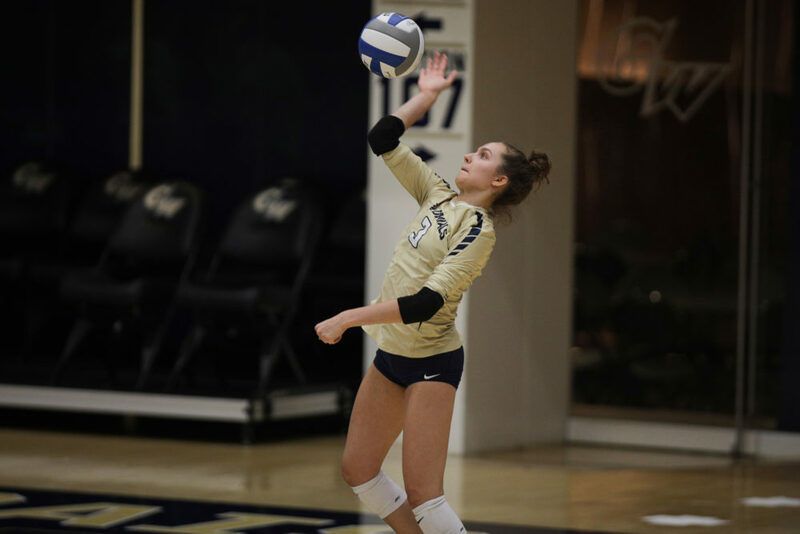 The Colonials are in the process of settling into a new defensive lineup after losing outside hitter Aaliyah Davidson, setter Stacey Benton and opposite Krystal Moor – who accounted for 34 percent of the digs in the 2017 season – to graduation in the spring. Bowman now runs the floor from a defensive standpoint with the aid of Welch by her side. Instead of employing three players in the Colonials’ serve receive, the duo occasionally handles the responsibility themselves. Bernson said this setup allows players who aren’t as strong defensively to be removed from passing. “I think communication is really key whenever we’re back there together, especially when it’s just us two and not a three-person pass,” Bowman said. The players’ similarities don’t just show on the court. The Louisville, Ky. natives both played club volleyball in high school at Kentucky Indiana Volleyball Academy and attended the same high school. Bernson said the Kentucky Indiana Volleyball Academy is known in the volleyball world for producing top-notch liberos, including Nebraska senior Kenzie Maloney, who led the Cornhuskers to an NCAA Championship last season. Although the duo did not compete for the same team within the club or at their high school, Welch said they occasionally practiced in the same group at 5:45 a.m. together before heading to class. Bowman said their shared experience has made communication between the two easier now that they share the court at GW. Although the biggest challenge on the court so far has been trying to coordinate communication between the front and back rows – something the team has been working on improving this season – the early success of both young players has given Bernson a better idea of what the team’s defense will look like in the future. “I think those two are clearly going to be our passing and defensive leaders for these next few years,” Bernson said.